Below is a list of various information pertaining to the SCSD ESS unit. For unit images, refer to the Current List of Sheriff Special Operations units in the Reference Area. An outline is posted below. This SOG serves as a guide for the responsibilities of each position in the “stack” for a tactical operation. It should be noted that this is only an SOG and not an SOP, and therefore these are only suggestions and not requirements. *Note: This formation can also be implemented when the fifth member of the team is acting as a marksman. Responsibilities: First man through the door. When breaching, take the left side of the room. Responsibilities: Pretty self explanatory. When breaching, immediately take the right side of the room. Responsibilities: First responsibility is to the tactical situation and not to medical. Medical operations are only done once the room with the victim and the surrounding rooms are clear and secured. When breaching, hold the front left quadrant, behind the #1 man. Responsibilities: Also self explanatory. The first responsibility is to keep the team secured from the rear, but when the team encounters an obstacle, it is his job to overcome the obstacle. *Note: This formation is largely the same as the column formation, with each of the team members lined up abreast of each other. The #1 man is lined up on the left side of the formation, with the #2 man on his or her left. The #3 man is lined up to the left of the #2 man and to the right of the #4 man. Equipment is the same as above. *Note: This formation is deployed when covering a large, open, outdoor area. It consists of one team member leading the formation, with one team member on one side and the other two team members on the other side. A picture is shown below. **Note: This formation can also be deployed with a fifth team member acting as a marksman. Responsibilities: Pretty self explanatory. Cover the front of the formation. If the unit should break into two elements, this operator works with the #2 man. Responsibilities: First responsibility is to the tactical situation and not to medical. Medical operations are only done once the room with the victim and the surrounding rooms are clear and secured. If the unit should break into two elements, this operator works with the #1 man. Responsibilities: Again, obvious. Watch the front side of the formation and breach any obstacles encountered by the team. If the unit should break into two elements, this operator works with the #4 man. Responsibilities: Cover the front side of the formation, with special attention paid to the right flank. If the unit should break into two elements, this operator works with the #3 man. *Note: This formation consists of a pointman and two members on either side of the pointman. 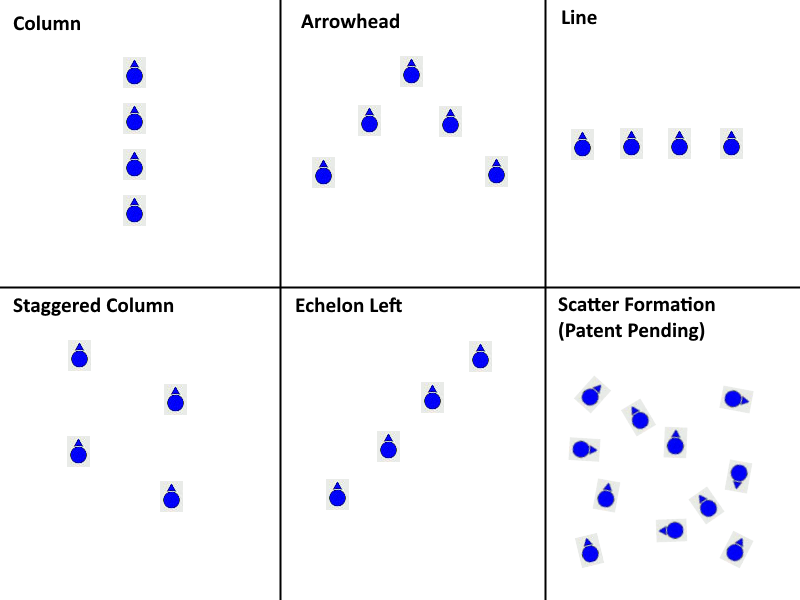 See the arrowhead formation in the image below. Responsibilities: First responsibility is to the tactical situation and not to medical. Medical operations are only done once the room with the victim and the surrounding rooms are clear and secured. **Note: This formation must be deployed with three or more officers. This formation is often used once victims have been recovered inside of an active shooter situation. The equipment and weapons listed here are only for if this formation was the initial plan, not if the team shifted into this position after rescuing victims. *Note: This formation consists of one forward facing officer, two officers on the sides and one officer at the rear. This formation is for asset protection. Responsibilities: Cover the team from the rear of the formation and to either side of the formation.